So, this week’s TOT was preempted by the day trip desert adventures but, as promised, here is the news–although Post Master Mike says not much has been happening around these parts–things are brewing. Jack was still on the nest tree when I returned. Which I personally feel better about because he is sure hard to keep track of when he is out flying around the forest. One of the neighbors got to see one of the adults scoop up a trout for dinner one night on the way to the Post Office while another called in all the dead trout to the unconcerned agencies. 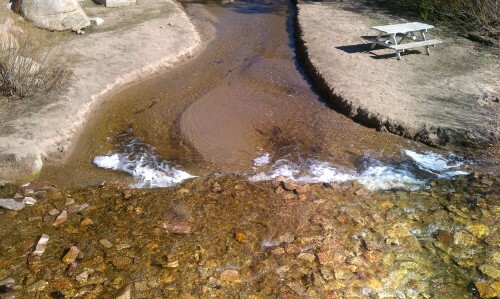 The creek has been rising and falling and many get stranded or are too tired to continue. I watched one get stuck, rest, and then barely make it back into the stream. Sad as it seems, it is nature’s way. And although I’ve seen a few owners creek side allowing their dogs to harass the fish, I haven’t personally seen any grab them and drag live trout out. Okay, now that I got that super-duper important update to ya…time for the sorta news. This Saturday, May 5th at 8:30am people will be down at Stanfield Cutoff and North Shore Elementary in preparation for the annual MS Walk Big Bear 2012. The Big Bear event, a brainchild of Fawnskin Folks, has raised over $750,000 for the cause so far. Many locals participate and you can join the action too! The MS Walk is scheduled for May 5, 2012 signup online or at North Shore Elementary School on the day of the event starting at 8:30am. There will be a Cinco de Mayo dinner at Moose Lodge 2085 following the event (5ish) that is hosted by Dave Emig & Crew, the cost is a mere $10 and all proceeds will go to MS.
You can get more MS Walk Big Bear information by emailing walkms@cal.nmss.org or calling (800) 344-4867. Bear Valley Community Hospital (BVCH) will be holding a ground breaking ceremony for their new expanded facility at the Bear Valley Community Hospital on Wednesday, May 9, 2012 at 10:00am in the west parking lot. Plans are for the the Family Health Center and The Mom & Dad Project to be housed in the expanded facility which will contain 12 exam rooms, three treatment rooms including a “well and “sick” area for people to wait and two large meeting and activity rooms. If you are interested in volunteering, please contact Eric Lewis by email at ericlewisbigbearlake@yahoo.com or phone (909) 800-4371. A volunteer orientation will be held a few days prior to the event. 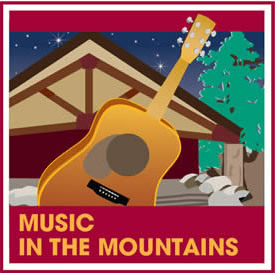 Music in the Mountains will kick off in June but now is the time to order your tickets. VIP season membership passes are $150 each, season passes are $125 each. You can grab individual event VIP ticket packages or general admission tickets for all five events at the Discovery Center Adventure Outpost at 40971 North Shore Drive on Hwy 38 here in Fawnskin, CA or call (909) 866-3437. This entry was posted on Friday, May 4th, 2012 and is filed under Events, Mountain Lake Resort, Talk of the Town.